Aaron (aged 4) has been helping me review a couple of Weleda products - the first review was of the Weleda Calendula Weather Protection Cream and today the Calendula Cream Bath. Bath times are I feel very precious, sometimes they can be full of fun, laughter, toys and mess and other times quiet and relaxing preparing for bed and sleep. The one thing I don't compromise on is the products that I use on my child. Around water your children trust you to keep them safe but I also feel that that includes the products that you use on them. Personally I check all labels to ensure that the products that Aaron uses are paraben free and as gentle as possible and have a few brands that I buy regularly and rarely venture far away from. If they cost a bit more then so be it. Weleda baby products care for your child's skin from the very first day with natural ingredients. The mild formulations developed in collaboration with midwives, are specially formulated to care for baby and infant skin. Our products provide comfort and promote the development of healthy looking skin. A creamy bath milk to cleanse gently without drying. Naturally fragrant and free from synthetic detergents. 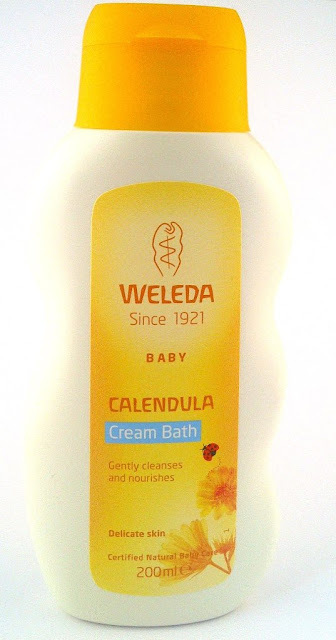 Weleda Baby Calendula Cream Bath gently cleanses and cares for your baby's delicate skin. Precious Almond and organic Sesame oils envelop your baby in warmth, keeping the skin smooth and supple and protects the skin from moisture loss. To use - Add to running water when bath is almost full. Mix using hand. Well this has been a complete hit with Aaron he loves the creamy lemon scent and it leaves his skin so incredibly soft after his bath and he smells so lovely too. As an aside I use it on him as a wash rather than popping it into the bath and I only need to use a teeny tiny amount to clean him.